Grippingly interweaves the stories of Lily, vintage fashion blogger, Joy, a 1950s New York socialite and the iconic dress she commissioned Lily Fitzpatrick loves vintage clothes – made all the more precious because they were once owned and loved by another woman. Thousands follow her vintage fashion blog and her daily Instagram feed. But this passion for the beautiful clothes of the past is about to have unforeseen consequences, when Lily stumbles upon the story of a 1950s New York beauty, who was not only everything Lily longs to be, but also shares Lily’s surname. Joy Fitzpatrick was a legend. But what was the famous dress which she once commissioned – said to be so original that nothing in couture would ever match it again? What happened to it – and why did Joy suddenly disappear from New York high society? Kate Kerrigan’s enthralling novel interweaves the dramatic story of Joy, the beautiful but tortured socialite and that of Lily – determined to uncover the truth and, if possible, bring back to life the legendary dress itself. A great, easy holiday read! A believable plot; with characters that were well developed, engaging you from the first chapter. The story flicks between New York in the 1950s, centring on Joy and Honor and modern day London with fashion blogger, Lily, with ease. Most of our group felt that while Lily’s journey was well written, we were turning her pages quicker to get back to what was happening in New York. While we all loved the storyline and the way it finished, we also felt that the last chapter left us feeling a little flat, feeling it could have ended one chapter earlier. Recommend for anyone who loves a bit romance, fashion and New York in the 50s. The book also reminded us a little of Cecilia Ahern’s books. 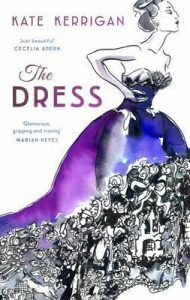 This entry was posted in Book Club Kits, Book Reviews, Fiction and tagged book review, Fiction, Kate Kerrigan, The Dress by admin. Bookmark the permalink.